Project Background (2003). India’s power sector is characterized by inadequate and inefficient power supply. Plant availability and efficiency are generally low, and system losses are high throughout India’s T&D networks, specifically the secondary low tension or last mile distribution networks. The financial performance of the sector is unsatisfactory with low tariffs, heavy cross-subsidies, poor collection performance and outright theft, combined with increasingly tight state budgetary resources that have constrained supply expansion and investment in upgrading T&D systems. Any solution that addresses the problem of sector profitability must necessarily target the issue of high T&D losses estimated at over 50% and amounts to over $ 6 billion annually or about 2 percent of India’s GDP. These commercial losses, which have historically doubled every 3 years, represent 10-15% of a typical state’s fiscal deficit and is double of what the country spends on health and half of its expenditure on education. At the heart of the energy loss problem lie the pervasive issues of poor metering, inefficient billing and inadequate revenue collection, the result of a lack of systemic across-the-board governance. Starved of funds Indian State Electricity Boards (SEBs) have made inadequate investments in distribution networks that result in overloaded feeders, ill-maintained substations with aging transformers and insufficient reactive compensation capacity causing a high level of technical losses particularly in rural power low voltage systems. Compounding the issue of poor design and operation of the distribution system are the losses on account of unmetered supply and theft – euphemistically referred to as “commercial losses”. The major inefficiencies in the electricity distribution sector inhibit a more rapid and comprehensive reform of the energy sector throughout the country. The constraints imposed by the tariff subsidy and inefficiency issues in the rural distribution sector were well known, but the solutions were difficult to pursue as they carry with them social and political implications. CORE International, Inc. was contracted by USAID/India to study the endemic problems in the sector and to design a new USAID activity in Distribution Reforms (DR) to help address them. CORE researched the technical, commercial and attendant social issues and devised a program for USAID to strategically apply targeted amounts of investment and technical assistance to coordinate and leverage the many ongoing activities related to distribution reform, utility demand side management and rural power distribution being implemented by other donors and the World Bank. CORE International prepared a comprehensive approach for USAID funding that included four components in the areas of technical assistance activities, pilot programs, training and capacity building, and equipment procurements (upgrades). 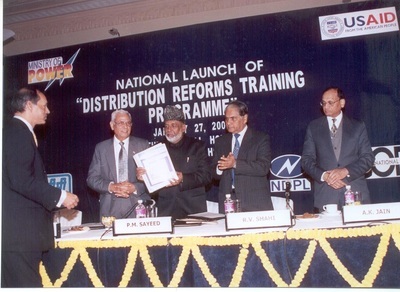 In 2004, CORE International was selected to implement the Distribution Reform Upgrades and Management (DRUM) training component. DRUM Training received the highest acknowledgment and commitment by the Ministry of Power, Government of India, and during the DRUM Training Program Launch Event on January 27, 2005, the Honorable Union Minister of Power P.M. Sayeed himself inaugurated the four year DRUM Training Program. CORE partnered with a large number of local entities in India in order to meet the objectives of DRUM which was to provide training to up to 25,000 utility engineers, managers, regulatory commission personnel and staff of the various states. 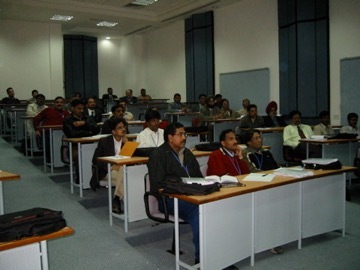 The first courses were provided by CORE in conjunction with the National Power Training Institute (NPTI), Power Management Institute (PMI) of the National Thermal Power Corporation, the newly established Center for Power Efficiency in Distribution (CENPEID) of New Delhi Power Ltd., and the Reliance Energy Management Institute. Other DRUM partnering institutions include the Administrative Staff College of India (ASCI), Central Institute of Rural Electrification (CIRE), Central Power Research Institute (CPRI), The Energy and Resources Institute (TERI), and several Indian Institutes of Technology as well as Indian Institutes of Management. CORE’s role was as Project Manager and to provide all needed technical support to the Indian professional training institutes. The Distribution Reform Upgrades and Management Training Program is a Signature Project of CORE International, Inc. www.coreintl.com.